Fluorouracil is used to treat various types of cancer. It is a chemotherapy drug that is used alone or in combination with other medications to slow or stop cancer cell growth. 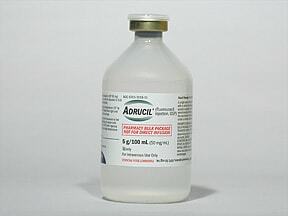 What conditions does Adrucil Vial treat? Tell your doctor right away if you have any serious side effects, including: headache, mental/mood changes (e.g., confusion), vision changes, unusual eye movements, loss of coordination, unusual tiredness. Get medical help right away if any of these rare but very serious side effects occur: easy bruising/bleeding, blood in the urine, black/bloody stools, vomit that looks like coffee grounds, stomach/abdominal pain, chest pain, jaw/left arm pain, fast/slow/irregular heartbeat, mouth sores, sore throat, painful swallowing, heartburn, pain/redness/swelling of the arms/legs. List Adrucil Vial side effects by likelihood and severity. Before using this medication, tell your doctor or pharmacist your medical history, especially of: poor nutrition, decreased bone marrow function/blood cell disorders (e.g., anemia, leukopenia, thrombocytopenia), a certain enzyme deficiency (dihydropyrimidine dehydrogenase - DPD), a serious infection, liver problems, kidney problems. What should I know regarding pregnancy, nursing and administering Adrucil Vial to children or the elderly? A product that may interact with this drug is: warfarin. 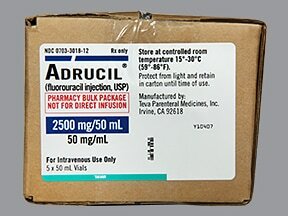 Does Adrucil Vial interact with other medications? Are you taking Adrucil Vial? Are you considering switching to Adrucil Vial? 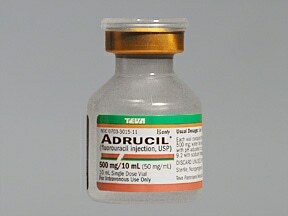 How long have you been taking Adrucil Vial?